As most of you know, I’ve spent the last year or so dealing with the fallout of deteriorating hip dysplasia. For the most part, daily life isn’t deeply affected–evening stiffness, a bit of a limp when I’m tired, and an occasional wince-worthy pinch if I step wrong. It’s my martial arts training that took the biggest hit. Multi-hour sessions of intense training are a thing of the past, as are sharp sparring matches, most kicks above the knee, and anything that requires lots of torque or pressure on that joint. 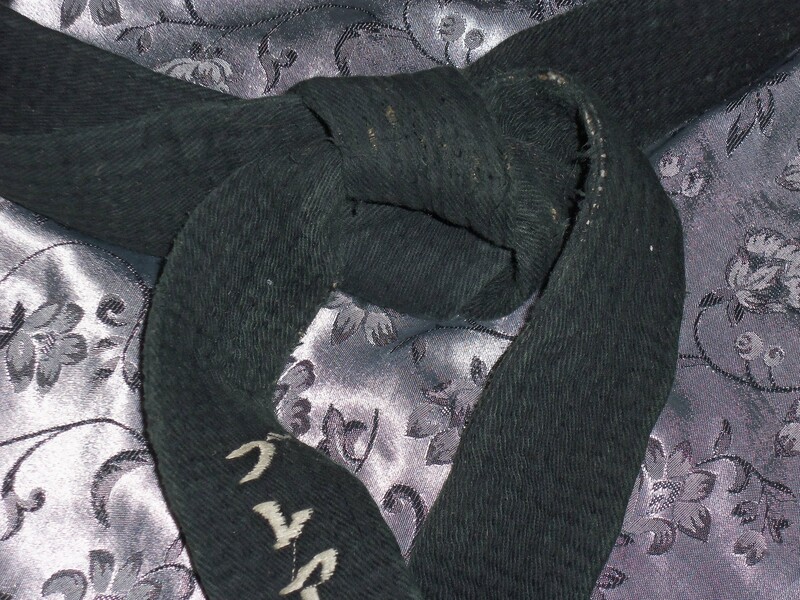 Considering all that, I’d pretty much given up on testing for my Sandan rank (aka third-degree black belt). Yes, I could perform the material… if I could spread my demonstration out over a few days. But an hours-long high-intensity test? Erm, no. Not only was it doubtful I could get my hip to hold up for that long, I was certain I didn’t want to create more damage than I could properly recover from. And it totally bummed be out–even moreso because I’d been on the verge of testing way back when my elbow dislocated. The complete healing of those ligaments overlapped with the decline of my hip and… well. That was that. Thus you can imagine my shock and my weepiness when, after I ran the belt promotion for my own students, my teacher announced my promotion to Sandan. So. There it is. Sandan. Me. Whoa. Congratulations, Blair! V. happy for you! But sorry about the dysplasia, too. This is how life SHOULD work. Congratulations on a job well done. Now y’all be careful, you hear?